Discover a desert oasis at this Tucson, Arizona hotel, featuring five outdoor swimming pools, a 143-foot waterslide, five restaurants with a variety of Southwest-style dining options, golf, tennis courts and more. If you're feeling adventurous, explore miles of equestrian, birding and hiking trails at Catalina State Park and Coronado National Forest. Plush rooms and suites afford spectacular views of the city and desert surrounds. 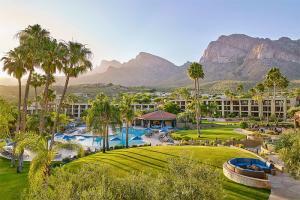 Located about 23 miles from Tucson International Airport.